Do you bring joy to others through your homemade gifts? At Continuum Care Hospice, we have a unique volunteer opportunity just for you! As part of our bereavement program, we give Forever Bears to our grieving families. 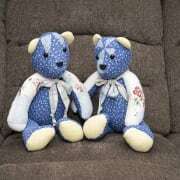 We are currently in need of someone to sew the bears or donate bears for our bereavement program. Bears can be made anywhere as long as you send the finished product back to us so the Forever Bear can be presented to the family. The volunteer is an important member of the Continuum Care Hospice team. The families who receive Forever Bears are reminded that the team is still thinking about them after their loss. Come and be part of a friendly, flexible team and put your talents to work improving the lives of others. Flexible! We will work with your schedule!